Branch Out Project provided a programme of outdoor activities for young people with autism approaching school leaving age that builds resilience through increased confidence and self-esteem. The Outdoor pursuits helped the young people gain skills in team working that aims equip them for life after school. Branch out is a programme of outdoor activities for young people with autism who are approaching school leaving age that ran over six months from September 2017 until March 2018 and is a partnership between Scottish Outdoor Education Centres and Lothian Autistic Society. The Society was responsible for selecting participants from its contacts, liaising with families and carers, providing trained staff to support the young people in their activities and overall programme management. Over 18 sessions young people undertook outdoor activities including walking (in woodland and on the hills), climbing activities (crate, rope and tree climbs at Broomlee, Ratho climbing centre and at Blackford Quarry), raft building, orienteering, archery and wildlife investigations. Built into this were various social activities and young people were encouraged to communicate with each other and express their emotions throughout the programme. One weekend incorporated an overnight stay, with the young people undertaking a night hike around the local area. This was a great success and will be incorporated into future programmes. Two sessions involved family days, where the participants were able to show family members what they had achieved as well as engage them in some of the activities. Again this has been a very positive experience, with parents commenting positively on what they have seen. The programme concluded with an evening where participants were awarded certificates for their achievements. Branch Out was developed as a partnership between Scottish Outdoor Education Centres and Lothian Autistic Society following a pilot based on the SOEC Transition to Work Programme. The participants in the pilot were a group of young people aged 16/17 who had been attending the Society's Social Club for a number of years previously and who consequently knew each other well and had, to an extent, already established relationships. However these developed significantly during the project. Branch Out brought together a group of young people who had limited prior contact with their fellow participants, although most had previously attended activities run through the Society. It became clear during the first phase of the project that significantly more time was needed to allow natural relationships to develop between the participants as a lot of staff time became diverted into managing tensions and conflict between various individuals. Future programmes will involve more time on a variety of purely social activities that will allow this to be addressed and resolved before introducing the additional stress and anxieties associated with the challenging outdoor activities. A second issue that became apparent during the activities concerned equipment and clothing for outdoor activities. Although the young people and their families had been given lists of appropriate and suitable clothing for the activities this resulted in a varied patchwork of solutions for the young people, with a wide disparity on how participants were kitted out for the activities. This became another source of tension between individuals around what was suitable and appropriate with a couple of young people becoming resistant to preparing for the activities. We are planning an additional budget element for personal outdoor equipment, which will feed into a shopping expedition (perhaps as part of the social programme) to allow everyone to get suitably and appropriately equipped for the outdoor activities. Branch Out is the first project where we have used the Outcome Star. For a number of practical reasons it had only been possible to train a limited number of staff in using the Star and it became clear during the project that this limited our ability to gather the information necessary for completion of the Stars for each young person (although we managed to achieve three completed stars for each participant). We are looking at ways to increase capacity in use of the Star for future programmes. We are keen to establish Branch Out as part of our core activities, thus not only allowing us to meet the needs of young people about to leave school but also providing some sort of end point in the involvement of young people with the Society. The Society is focussed on the needs of children of school age with autism (along with those of their families and carers). Historically young people have come to an end of their engagement with the Society when they reach their 18th birthday (or thereabouts), with only limited activity building on 'what next?'. . Branch Out allows young people to come together in a group to think about this and to be helped with their preparations for transitions with their peers in a way that is challenging but also supporting. All the young people finish at the same time and have an opportunity to celebrate what they have achieved, which is a significant improvement on what happened previously. We continue to seek funding for the project to continue. Fifteen young people will have completed a course of outdoor activities, most of which they will not have attempted before. They will have achieved this in a way that they have enjoyed and that has cemented friendships. Eleven young people undertook the programme, which ran from September 2017 through until March 2018 based at Broomlee Outdoor Centre, West Linton, Midlothian (some sessions were cancelled due to bad weather which made the centre inaccessible and additional sessions were incorporated at the end to compensate for these). 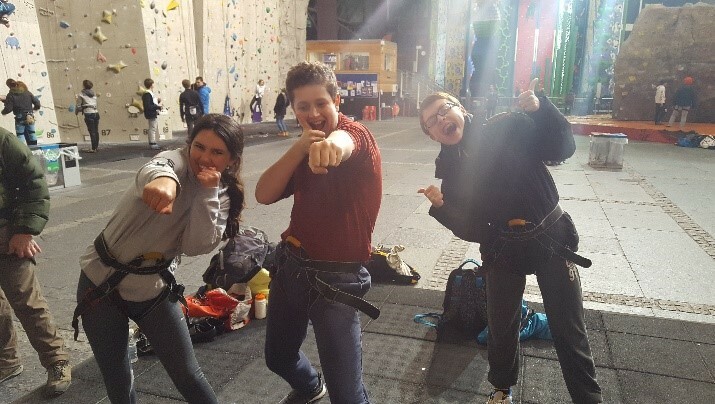 Sessions included activities such as archery, hill and woodland walks (including a night walk) and a variety of climbing related activities (crate climbs, tree climbs, rock climbing and abseiling). Two of the sessions gave the young people an opportunity to demonstrate what they had achieved to other family members. We introduced an overnight stay into the programme which was welcomed by participants and their families as many of the young people had never stayed away from family overnight before. Several young people have established friendships with others on the course. Carers will have had 18 days break from caring. Carers will have had an opportunity to see the skills the young person they care for has developed during the programme. Young people will have improved their personal well-being scores on the Outcomes Star. Sessions lasted from 9:15 am until 4:30 pm over 18 Saturdays, during which time parents and carers were able to do other things without being concerned about their child. The family sessions at the centre allowed families to see what their child had achieved and in many cases see their child in a completely different light. The Outcome Stars have demonstrated changes across many of the domains for both the young people and their families. Holly was resistant at first but Branch Out was an example of how much you can enjoy when you give something a chance. She is very proud of achievements and has some of the output on her wall in bedroom. "Branch Out gave us a bit of respite and allowed us to build and encourage follow on activities, Holly is currently considering a kayaking course. It’s an excellent programme, added real value and set the bar higher for Holly herself. It also allowed us to network with parents with similar challenges and compare notes"
Carers will have had regular, planned and significant (more than 6 hours during weekend days) breaks from caring which will give them time to use as they wish. The programme enabled carers to have regular planned breaks from caring. Young people were met in Edinburgh and travelled by minibus to the centre while their parents and carers had time to do other activities. Fifteen young people will have enhanced self-esteem and increased self-confidence. They will have demonstrated their capabilities to their carers and their progress across a range of personal indicators will have been recorded through their Outcomes Star. Outcome Star assessments were undertaken with participants at three stages of the programme, once at the start, a second after the overnight stay and activities and once at the end of the programme. This table shows the proportion of the particpants who made progress, stayed the same or slipped back based on their overall Star score. The Student Star's scales have 10 points. A 'big' increase or decrease is defined as an average change of at least 1 point up or down across all scales. A 'small' increase or decrease is defined as an average change up or down of at least 0.25 points and less than 1. 'No change' means an average change per scale of between -0.25 and +0.25 points. Big Decrease	Small Decrease	Same	Small Increase	Big Increase 9% 9% 18%	9%	55% Most of the participants show a significant progress across their average scores through the project. Young people will have had the chance to try a range of new activities in a safe and structured setting. They will have acquired new skills in using outdoor activity equipment and be able to assess the risks associated with the activity. We received 8 completed questionnaires from the young people who undertook the programme. All of those who completed the questionnaire said that had tried new and fun activities. They all reported that they had more confidence, especially in using the equipment that was provided for the activities. The programme was designed to challenge the young people to become more independent and to work together to achieve. 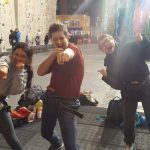 Feedback from one of the SOEC instructors at the Outdoor centre supports this: “The young people are only challenging themselves, and it is not competitive. The only rules in place are for safety and they do not change, in terms if using helmets and making sure harnesses are put on properly. The young people are taught how to do this, it is a repetitive task and this helps to reinforce it”. Shared Care Scotland's Facebook page can keep you up to speed on what we're up to, if you'd like. "I really enjoy coming to the young carers group and helps me relax with other young carers around me." Short Break Stories is a site by Shared Care Scotland, a company limited by guarantee registered in Scotland SC161033.